The Primary Care label contains relevant information used by healthcare professionals in the outpatient setting and fits our standard WhiteCoat Clipboards. This label contains useful information on EKGs, strength testing, CVA effects, blood pressure guidelines, commonly used antibiotics, A1C averages, BMI and much more. 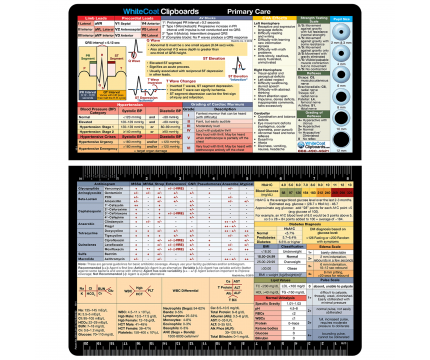 You can apply the label over the top of other WhiteCoat Clipboard labels or just about any surface to have a great medical reference at your fingertips. 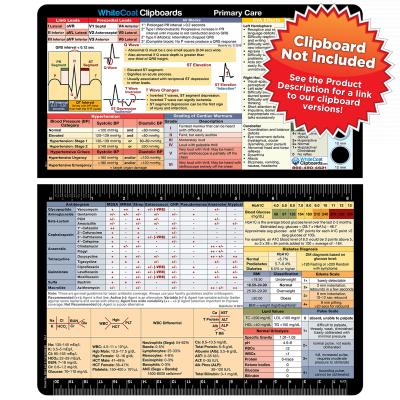 If you are looking for a clipboard with this label, check out our Primary Care Edition WhiteCoat Clipboards here!